Turn on your Quad-car with a smartphone and go! Cities are clogged up with petrol guzzling, loud, expensive, polluting cars, which is exactly what Scoot wants to change with their new 'Quad car' concept. 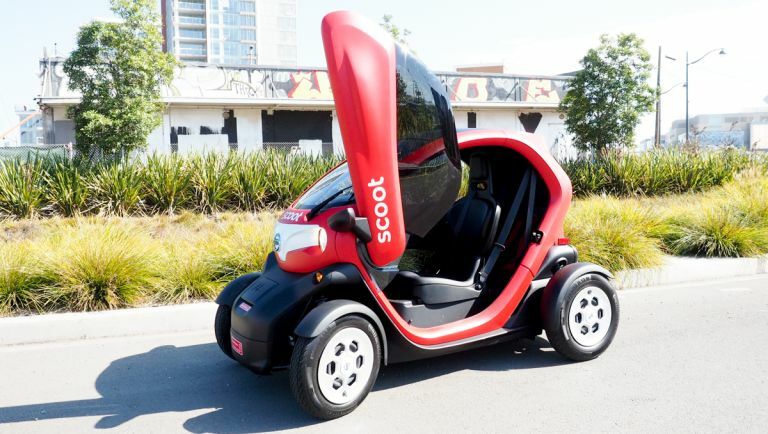 Scoot has teamed up with Nissan to create a four wheeled, two seater, enclosed vehicle to get you out and about in the city. The idea is that you rent one of these quad cars for the day or even an hour, to get you where you need to be without the hassle of renting a big bulky car. Currently being trailed in America, the 'Scoot Squad' are electric powered cars that can be turned on by a simple tap on your smartphone. Although only 10 of these cars are being trailed in city centres, it's a step in the right direction for compact, environmentally friendly transport in cities. Pretty much a scooter on wheels, you're also probably thinking how can I fit all the stuff I need for the day inside a Quad Car? Apparently you can still haul your groceries on the back of the Quad. The Quad is being deemed as a bit of a risk for Scoot and Nissan “As large cities continue to grow into megacities globally, we need to understand how transportation is changing and look ahead to anticipate what transportation needs will look like in the future,” Nissan Future Lab executive director Rachel Nguyen said. If the cars are a hit in the States they'll likely be hitting a city near you soon. Can't wait for the Scoot Squad to hit the UK? Then check out our electric car buyers guide.